Centuries ago, life in Dubai started around the Creek, a saltwater tidal channel dividing Dubai in two main parts, Bur Dubai to the Western side and Deira to the East. With the first records of the town being made in 1799, life was then mainly sustained by fishing and pearl diving. Dubai became a separate Sheikdom in 1833, when the Al-Maktoum dynasty of the Bani Yas clan took it over peacefully. The invention of artificial pearls in 1926 and the Great Depression in 1929 caused a collapse in the international pearl market, which resulted in Sheikh Saeed looking for an alternative source of income and Dubai becoming one of the leading re-export ports in the world. In 1966, oil was discovered in Dubai, which changed the country beyond recognition and led to Dubai becoming the vibrant, modern, business-centred city-state it is today. Even today the Creek still has the guzzle and buzzle it used to have in the early days. It is a Mecca for travel photography. I finally decided to open a gallery dedicated to the "Life at the Creek". Browse through a few years of images here. One of the must do's for every Dubai visitor is taking an Abra (small wooden boat) across the Creek. Quite often I bump into people who have been living in Dubai for years and have never done the crossing. You are missing a unique experience! And yes it is cheap... 1 DHS (1/4 USD) for a single trip! 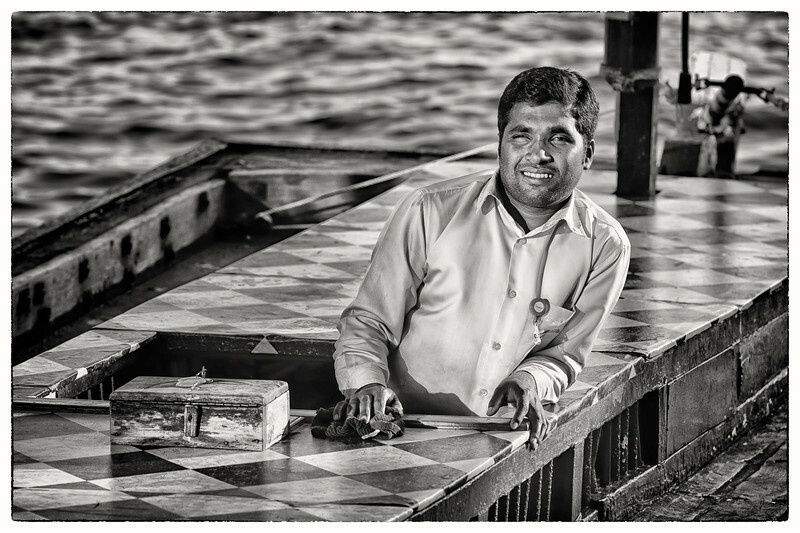 While wandering around the docks, I photographed this "Abra driver" bathing in the evening sun. Remember don't just take pictures, make pictures! My first encounter with Hungarian pilot Zoltan Veres was during the 2007 Al Ain airshow in the UAE. 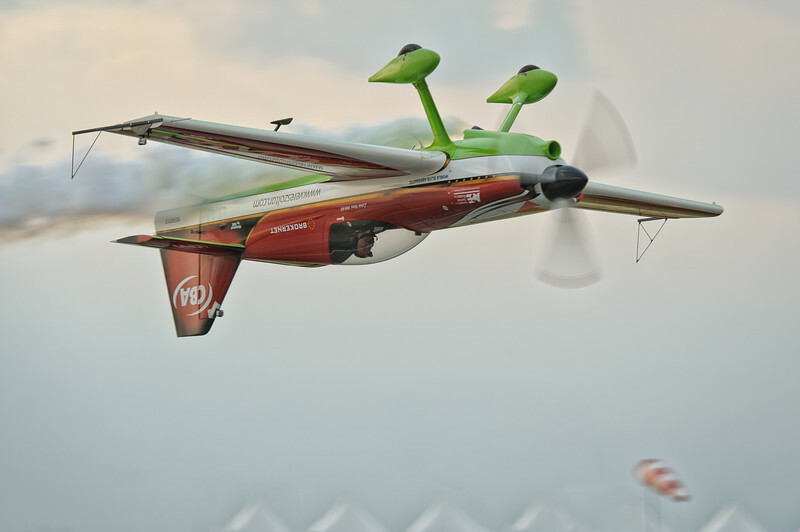 Zoltan belongs to the top of the world aerobatic performers. He is a regular visitor to the UAE and normally has one or more of his aircraft based here for the winter. Last time I saw him perform amazing aerobatics in his MXS aircraft, was at the Skydive Dubai Marina drop Zone (DZ1) end of 2011. He surely knows how to entertain a crowd! As a yearly tradition early in the new year, I've now made a selection of my best 3 Architectural, Aviation and Travel photography images. Overall I've just over 10.000 keeper images in my Lightroom library. Only just over 1% of them have received a 5 star rating; these I consider my personal best. 2 Mosque in Umm Suqeim, Dubai. Just behind the world famous Burj al Arab, one finds this mosque. Even though I've shot quite a few images of the mosque together with the 7 star hotel, I like this stand alone image because of its structure at night. 3 Karlskirche in Vienna, Austria. I did shoot more Black & White architectural work than the preceding years. Taking the color away focuses the attention more on the building itself. I also like the reflections in the fountain pool. 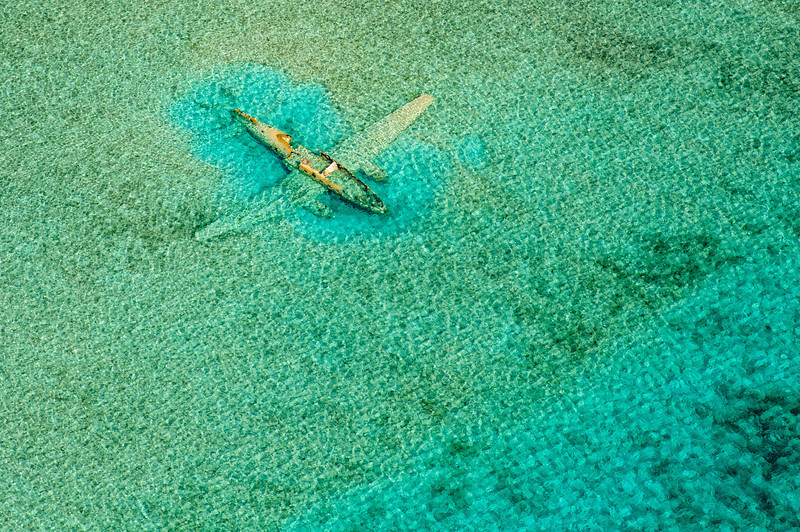 1 Ditched Curtiss C-46 Commando near Norman's Cay, Bahamas. Made during my recent Florida and the Bahamas from sea level to 1000 feet tour. Even though I really liked this image from the start, the feedback on my 500px site has been mind boggling; approaching 17.000 views and 1100 votes, this images must be my personal image of 2011! As icing on the cake, the image was selected by National Geographic as Photo of the day in the first week of 2012! People also seemed attracted to the story behind the airplane. I guess a picture is really worth a thousand words! For more make sure you read this blogpost. 3 Zoltan Veres coming from the moon in his MXS. Amazing flying by this great Hungarian pilot. Zoltan demo's his MXS on a regular basis at the Skydive Dubai, Marina drop zone. He surely knows how to "wow' the crowd! 1 Chapelle de Roumé, Cieutat, France. In 2010 I started flying paragliders together with my wife, in the French Pyrenees. During our first training week in May, we "lost" of few flying days, but did some interesting travel-landscape photography instead. This lonely chapel overlooking the French mountain chain, really symbolizes this trip! 2 Mosque 20km from Hatta, UAE. Not that far from home in Dubai, I wanted to document the Hatta pools area. If one want to see the "original UAE" this is a good place to start. 3 Bimini shipwreck, the Bahamas. During our Florida and the Bahamas from sea level to 1000 ft trip, I photographed the remains of Gallant Lady, a old cargo vessel on the North-Bimini island. As we are now into the third week of 2012, it looks like it will be another great year for photography. Trips planned so far are a ski-trip to Austria in February, another visit to the Spring break for pilots fly-in in Lakeland, FL end of March, a paragliding trip to France and probably a two week South-East Asia trip after the summer... to be continued! Some of you might know that I spend the early years of my flying career in and around skydiving ("parachuting") operations. I've flown "left seat" in a broad series of skydiving aircraft; Cessna 206, Britten Norman Islander, GAF Nomad, Short Skyvan. Beside I also have "right hand seat" time in the Antonov AN-2, Let L-410, de Havilland DHC-4 Caribou, C130 Hercules. A great skydiving aircraft I have never flown in is the Canadian built, de Havilland DHC-6 Twin Otter. This is the backbone of "Skydive Dubai", a sport parachuting club based in guess where... Dubai! 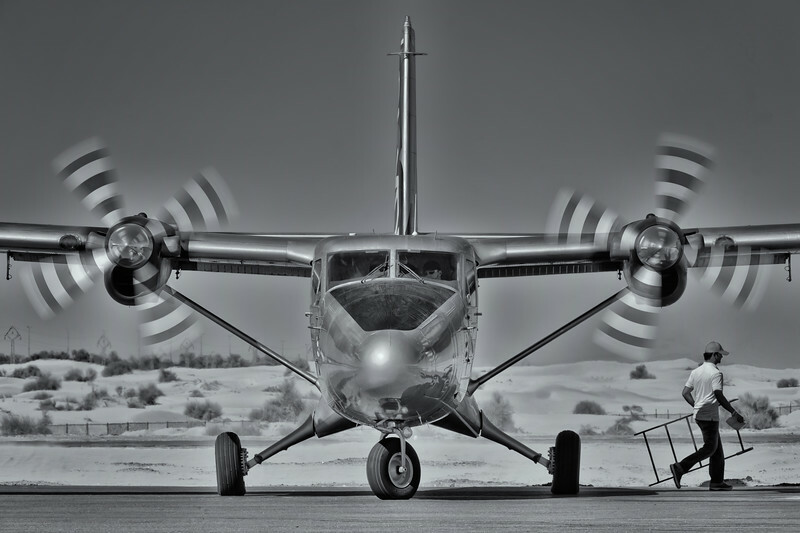 The image above of one of the club's two Twin Otters, was made at the second drop zone, SD2, otherwise also called the "Desert campus"; a fully equipped Skydiving center on the Dubai to Al Ain road. Skydivers need a minimum of 100 jumps (B license) to jump at the Dubai Marina drop zone (SD1), which is close to high-rise buildings and is surrounded with lots of water. The aircraft had just picked up a fresh load of Skydivers and was on its way for another elevator ride to 12000 feet.